This teen-focused retailer's sales growth streak just graduated to an impressive ten straight years. What: Specialty retailer Five Below's (NASDAQ:FIVE) stock jumped 11% higher in June, according to data provided by S&P Global Market Intelligence. The rally has pushed shares to an almost three-year high, with the stock up 40% so far in 2016. So what: Investors cheered first-quarter business results that showed positive momentum continuing through from an impressive holiday-season quarter. 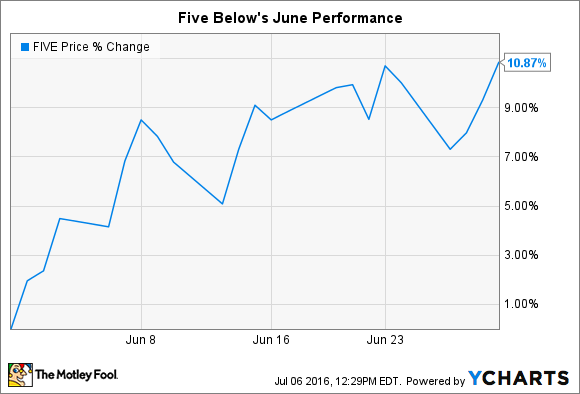 Five Below's comparable-store sales rose by 5%, the company announced in early June. A fast-rising store footprint contributed to the encouraging results and pushed overall revenue up by 25% to $200 million. Net income spiked higher by 60% as profitability held steady over the expanding sales base. "We are very pleased with our first quarter results," CEO Joel Anderson said in a press release . Now what: Anderson and his team reiterated their 2016 outlook that calls for Five Below to reach $1 billion in annual sales this year. Considering the retailer only managed $420 million of sales in 2012, that result would translate into 24% compound annual growth since then. A key risk is management's misjudging demand and thus losing loyalty from the teen and pre-teen customer segment that Five Below targets. Another is that a disproportionate level of sales and profits are generated in the holiday quarter, which can magnify the financial pain from any misstep or even from weakness in the overall industry. If trends continue as they are, though, the company should see strong sales growth from entry into new markets, while rising customer traffic keeps comps churning higher. In the meantime, there's no question that the stock is expensive at nearly 40 times this year's earnings. But in my view, that's not too high of a premium for this retailer: it's just posted a tenth consecutive year of comparable-store sales gains, and is improving overall sales at an annual clip of more than 20%.